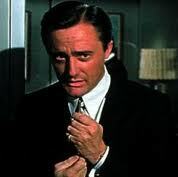 Robert Vaughn, star of The Man From U.N.C.L.E. television series, died today at 83, according to an obituary at Deadline: Hollywood. The actor died after battle with acute leukemia, according to the entertainment news website. Vaughn had plenty of roles over a long career, including The Magnificent Seven (1960) and Bullitt (1968). He remained active in recent years, including a U.K. stage production of 12 Angry Men. Still, The Man From U.N.C.L.E. which ran from September 1964 to January 1968 on NBC, made Vaughn a star. He played Napoleon Solo, a character created by Norman Felton and Ian Fleming. Solo was an enforcement agent for the United Network Command for Law and Enforcement, an international agency. U.N.C.L.E., which was developed fully by writer-producer Sam Rolfe, was a post-Cold War series airing in the midst of the Cold War. Vaughn’s Solo had similarities to Fleming’s James Bond. Both were womanizers and sophisticated in the ways of the world. But Solo worked with a Russian agent, Illya Kuryakin (David McCallum). In the Bond film series, the notion wouldn’t occur until 1977’s The Spy Who Loved Me. Solo also had more of a moral code than Bond. Part of the format called for Solo to interact with “innocents,” ordinary people either recruited to help U.N.C.L.E. or who stumbled into the action. As a result, Solo had to look out for the innocents, which made his character different than 007. In the final episode of the series, Vaughn had one of his best scenes as he confronted the conspirators of a plot to take over the world. That was a familiar plot of escapist 1960s spy entertainment. Yet, in that scene, Vaughn played it entirely seriously, giving the proceedings a gravitas they might ordinarily lack. Years after the series, Vaughn had a lengthy interview with the Archive of American television. Here’s a clip where he discussed U.N.C.L.E. In real life, Vaughn was an intellectual. He studied for his Ph.D while U.N.C.L.E. was in production. Vaughn, an opponent of the Vietnam war, debated the subject with William F. Buckley on the latter’s Firing Line series. Buckley introduced Vaughn as “a professional actor.” However, Vaughn was thoroughly prepared and the debate (on Buckley’s home turf) was judged a draw. Post-U.N.C.L.E., Vaughn tended to play villains, such as the politician he portrayed in Bullitt. He did get to reprise the Solo role in the 1983 television movie The Return of the Man From U.N.C.L.E. He indicated he’d be willing to play a cameo role in the 2015 film version directed by Guy Ritchie. But he was never approached. Vaughn died 11 days short of what would have been his 84th birthday. We’ll have a more detailed “appreciation” post tomorrow. The Magnificent Seven, Metro-Goldwyn-Mayer’s second remake this year, fared considerably better in its opening weekend in the U.S. compared with the studio’s “re-imagining” of Ben-Hur. The western film generated an estimated box office of $35 million, according to Box Office Mojo. The film was a remake of the 1960 film of the same name released by United Artists. MGM acquired UA in 1981, including its film library. In addition to the 1960 Magnificent Seven (and its sequels) that film library at the time also included the first 12 James Bond films produced by Eon Productions. Both the 1960 and 2016 Magnificent Seven films, in turn, were based on the 1954 Japanese movie, Seven Samurai. MGM, which exited bankruptcy in 2010, is trying to demonstrate it’s more than just the 007 film series. MGM these days mostly makes television shows for cable channels while producing a few movies annually. The studio’s Ben-Hur remake, which was released and co-financed by Paramount, was a big setback for MGM. That movie’s U.S. opening weekend was only $11.2 million, finishing No. 6 that weekend, according to Box Office Mojo. Its total U.S. box office was $26.2 million. The movie generated worldwide box office of $82.6 million against an estimated $100 million production budget. The new version of The Magnificent Seven was distributed by Sony’s Columbia, which has released the last four Bond films. The post-bankruptcy MGM doesn’t have the resources to release its own movies. As a result, the studio strikes deals with bigger studios to distribute MGM productions. At this point, MGM doesn’t have a studio partner for Bond 25 after Sony’s most recent two-picture 007 deal expired with SPECTRE. MGM intends to sell stock to the public within three to five years. Metro-Goldwyn-Mayer reported first-quarter results on Wednesday, but provided no news about Bond 25. A call with investors and analysts ran 17:49. No questions were asked following formal presentations and the call quickly wrapped up. The only Bond references during the call concerned SPECTRE’s contributions, primarily via home video, to the quarterly numbers. Overall, MGM had a quarterly profit of $57 million, up from $56.8 million for the same three-month period in 2015. Revenue for the quarter slid to $311.3 million from $364.5 million a year earlier. MGM chief Gary Barber said during a March conference call that future Bond movies would come out on a three- to four-year schedule. MGM is looking for a studio partner to release Bond 25 after its contract with Sony Pictures expired with the release of SPECTRE. Under the now-expired deal, MGM and Sony split financing costs but MGM got 75 percent of the profits. The first-quarter call mostly played up upcoming MGM movie and television projects, including a Ben-Hur remake (being released by Paramount in August) and a new version of The Magnificent Sevent (being released by Sony in September). For people of a certain age, it’s doesn’t seem possible, but it’s true. 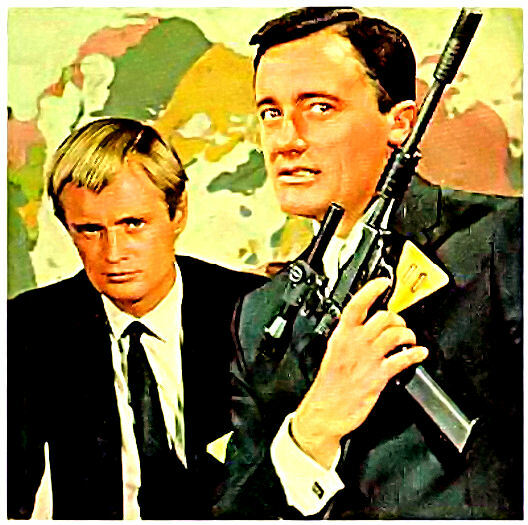 Robert Vaughn, The Man From U.N.C.L.E., turns 80 on Nov. 22. The 1964-68 spy series was just one stop on a long, and still continuing, career. He’s the last surviving actor of those who portrayed the title characters in 1960’s The Magnificent Seven. He picked up a nomination for Best Supporting Actor in 1959’s The Young Philadelphians, holding his own in a veteran cast. He was twice nominated for an Emmy in political-related drams and received one playing a thinly veiled version of H.R. Haldeman in the 1977 mini-series Washington: Behind Closed Doors. And he’s played more than his share of oily and/or villainous businessmen and/or politcians, thanks to 1968’s Bullitt. Still, when he shows up at collectible shows, he’s more than often or not autographing stills of himself as Napoleon Solo, the television spy with a name courtesy of 007 creator Ian Fleming and developed by Sam Rolfe under the supervision of executive producer Norman Felton. For those who weren’t there during its run on NBC, U.N.C.L.E. really was a big deal. The production values may look cheap compared to modern-day television. The series did all of its filming within about a 30-mile radius of Metro-Goldwyn-Mayer’s Culver City, California, studios. None of that matters. Vaughn established a U.S. beachhead for 1960s spy entertainment beginning in the fall of 1964. U.N.C.L.E. was pitched as “James Bond for television” but it successfully developed its own spin on the genre. Other fondly remembered shows followed, starting in the fall of 1965. Vaughn had help, of course. His co-star, David McCallum, became popular in his own right. Early episodes were directed by the likes of Richard Donner and Joseph Sargent, who’d go on to direct feature films. Writers including Alan Caillou, Dean Hargrove and Peter Allan Fields spun tales that hold up today, despite the modest production budgets. Still, it was up to Vaughn to sell everybody on all this. And sell it he did. Vaughn last played the character in the 1983 television movie The Return of The Man From U.N.C.L.E. But he remains tied to Solo. So happy birthday, Mr. Vaughn.